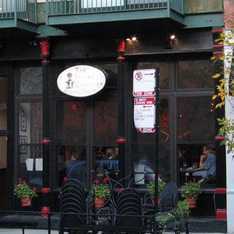 PEPPER CANISTER is one of our favorite lunch spots in the River North area. The red and black exterior holds no hint of the spacious interior, so don't judge this book by its cover. They've got Hoegarden on draft here, which is a rare find! The menu is not too extensive, but what they do have is excellent. The Scotch eggs are our absolute favorite! If you're not familiar with these, they are hard boiled eggs wrapped in sausage, then breaded, and deep fried. Delicious! This is true Irish hospitality at its very best.